Ten Kentucky public schools have been recognized for outstanding teaching and learning conditions. A winner is selected from each of the 7 Supreme Court regions of the state, with 3 ‘at large’ winners selected. The 10 Winners’ Circle schools represent a variety of grade levels and demographics. These Winners' Circle schools were recognized for their effective teaching and school leadership practices and will be shared as models of best practices across the state. The Winners' Circle schools were selected based upon their 2017 Teaching, Empowering, Leading and Learning (TELL) Kentucky Survey results, school safety and student achievement scores. 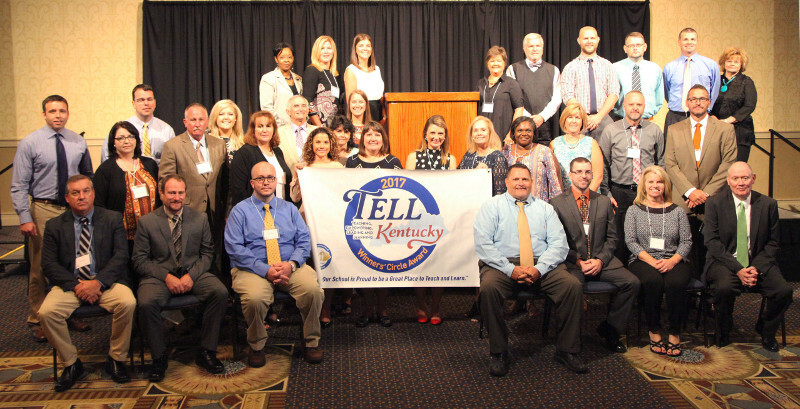 A team of TELL Kentucky partners made the decision as to the selection of the Winners’ Circle honorees, with final determination based on schools in each region with the highest growth in three TELL Kentucky constructs closely correlated with teacher retention and student achievement: school leadership, managing student conduct, and community engagement. To learn more about these schools, please read the booklet of winners from 2017. GC Burkehead Elem., Hardin Co.
GR Hampton Elem., Knox Co.
Green Co. Middle, Green Co.
West Marion Elem., Marion Co.
Scott Co. Middle, Scott Co.
Ersil P Wade Elem., Fleming Co.
Spencer Co. High, Spencer Co.
River Ridge Elem., Kenton Co.
Sandy Hook Elem., Elliott Co.
"My congratulations to our 2017 TELL Kentucky Winners’ Circle Schools. With their participation, these schools have discovered the power to unlock information on critical teaching and learning conditions and harness it as part of the ongoing improvement planning process. Setting goals based on whole staff feedback ? is a great way to enhance professional performance and student performance. Research has proven it time and time again; working conditions have a direct impact on the learning conditions for students. By effectively using the information gathered, the entire school shares ownership in improving school culture, student success and its ability to close the achievement gap." Read the Press Release for the 2017 Winners' Circle Awards.